Cyberwarfare increasingly crosses international borders, affecting diplomacy, the global economy, and privacy of citizens. Governments and corporations must set new frameworks to defend against nation-state attacks. 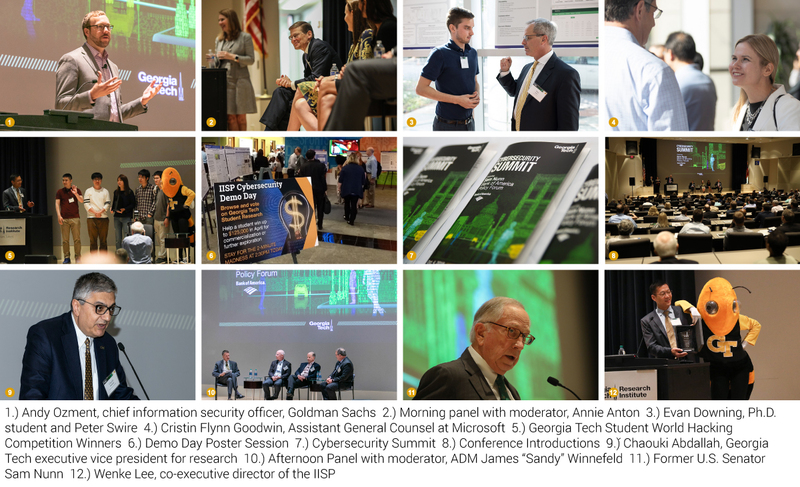 This issue was the focus of the Institute for Information Security and Privacy’s (IISP) Cybersecurity Summit, featuring the Sam Nunn Bank of America Policy Forum, on Oct. 4. 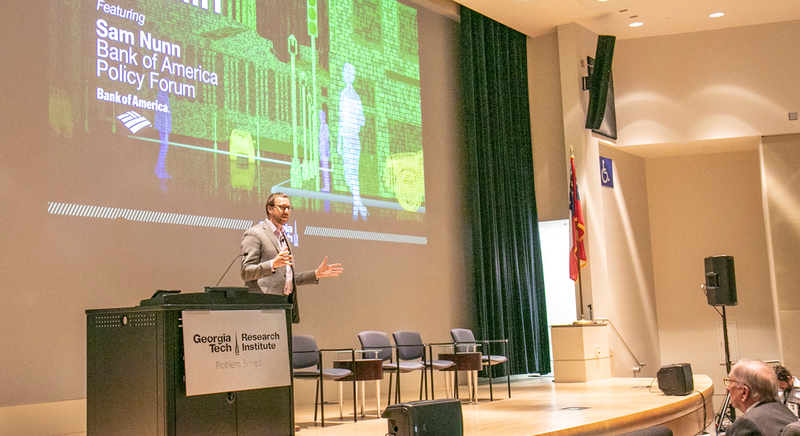 More than 270 cybersecurity academics and professionals attended the 16th annual event. IISP Associate Director of Policy Peter Swire organized this year’s policy focus. The combined event was due in part to the generosity of sponsors — including Bank of America for the Nunn Policy Forum, and Jones Day, Turner, and ADP for the Cybersecurity Summit. He suggested both companies and governments need to track threat environments to prevent attacks. Although the government can’t help every company, it can concentrate resources on certain areas and set a precedent to deter attacks. 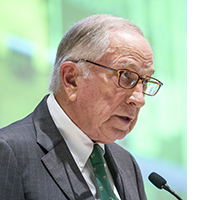 Senator Sam Nunn, a champion of cybersecurity policy and research, also made remarks. He is focused on issues of cyberwarfare, effective deterrence, cyber offense, attribution, the role of private sector in working with the government, and cyber understandings with other countries to restrain attacks. 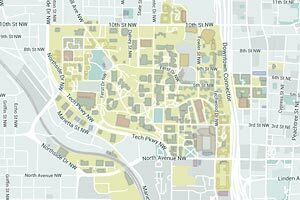 "I'm very proud of the role Georgia Tech is playing in security," he said. The discussion centered on deterrence and how governments could effectively deter nation state attacks without compromising security. Just before lunch IISP Co-Executive Directors, Michael Farrell, principal researcher at GTRI, and Wenke Lee, Imlay Chair and professor in the School of Computer Science, presented an award to r00timentary for their capture the flag (CTF) victory at this year’s DEFCON conference. r00timentary team members include Assistant Professor Taesoo Kim and his Ph.D. students Insu Yun, Wen Xu, Soyeon Park, Jinho Jung, master’s student Po-ning Tseng, and alumnus Yeongjin Jang. David Kris, founder, Culper Partners LLC; former assistant attorney general for national security, U.S. Department of Justice; former deputy general counsel, chief ethics and compliance officer, Time Warner Inc. The panel broke down how to find vulnerabilities in a company and why it’s so important for the government and corporations to work together. "The relationship between government and private sector regarding cybersecurity ebbs and flows,” Kris said. “Private companies generally don’t want the Feds in their network, but increasingly see the benefits from engaging DHS and, when needed, the FBI. From the government side, they're puzzled that some of these companies tell the public about an advanced persistent threat first." Enhanced information and threat sharing was highlighted as critically important for defending against nation-state attacks. The event ended with breakout sessions on FinTech, smart cities, and the role artificial intelligence (AI) and machine learning (ML) in cybersecurity. FinTech: Cybersecurity Risk in Financial Services and FinTech explored cybersecurity and regulatory considerations for FinTech companies, financial exchanges, payment processors, banks, and other financial services companies. Machine Learning: The Essentials of Cybersecurity for AI and Machine Learning explored the new considerations for CISOs, network administrators, and frontline responders associated with ML, and recent advances, including research underway at Georgia Tech. Smart Cities: The Security of Smart Cities under Nation-State Threats focused on the critical risk factors that need to be assessed as smart cities and vendors prepare for the evolving risks.